When the Russian government finished its regular session yesterday, President Putin invited Prime Minister Mikhail Fradkov and economic ministers for a special meeting. Putin started the meeting with a quote by O Henry: “Bolivar can't carry double.” The ministers understood that Vladimir Putin was still in the saddle, although his counterpart, Ukrainian President Viktor Yushchenko, had to go. “Bolivar” is Gazprom – Russia's largest natural gas monopoly. This figure of speech from Vladimir Putin marked the unsuccessful end of the talks with Viktor Yushchenko (on the phone) and Vladimir Litvin, the speaker of the Ukrainian government (tete-a-tete). According to Putin's calculations (the data were obviously presented to the president directly from the Gazprom administration), the Russian gas monopolist will suffer up to $3.6 billion of losses in 2006 because of Ukraine's fault. Ukraine currently receives Russian gas at the price of $50 per 1,000 cubic meters of gas. The price is at least $10 lower than extraction and transportation costs to Ukrainian borders. It would also be strange for Russia to sell natural gas at its prime cost to Ukraine. Putin stated yesterday that Germany would be paying $255 for Russia's gas already in the first quarter of 2006. Russia delivers up to 25 billion cubic meters of gas to Ukraine a year: the losses may total $4.5 billion. Putin acknowledged that the Russian budget already lost one billion dollars after the abolishment of VAT payments for gas exported to Ukraine. “This is like pumping money directly from the Russian to the Ukrainian budget. I am saying “directly” because we do not receive anything in return for it,” Putin said. The Russian president also said that domestic consumers start paying more for their own gas than Ukrainians do when they use Russian gas. It just so happens that Gazprom stops supporting the Russian economy and aims its efforts to Ukraine. It seems that Russia and Ukraine may find themselves on the brink of a “gas war.” Putin stated during his meeting with the ministers that the talks between Russian and Ukrainian gas companies should not affect the international ties between the two countries. However, Russia ships over 110 billion cubic meters of natural gas to the West via Ukraine. There is no alternative to this route. 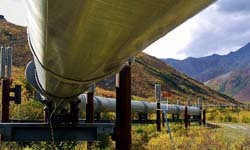 The North European Gas Pipeline will be completed in 2013. The gas dispute between Russia and Ukraine has become a subject for concerns for the European Union. If the EU continues to render political assistance to Ukraine, Europe may face the danger of fuel shortages. If Russia and Ukraine fail to come to an agreement, the latter will have to cease natural gas deliveries to the West. Ukraine has another option too: to steal the gas, which Gazprom delivers to European countries. As for Ukraine, it seems that Viktor Yushchenko and his team do not realize the gravity of the current state of affairs. Ukrainian experts qualify Russia's suggestions on the matter as political blackmail. To all appearance, the Ukrainian government counts on Gazprom's stalemate situation: the Russian gas giant will have to pump fuel across Ukraine during the construction of North European Gas Pipeline. Ukrainian President Viktor Yushchenko contacted his Russian counterpart Vladimir Putin on the phone last week. As it was mentioned above, the leaders failed to find a solution to the problem. However, it is Yushchenko, who will have to take urgent measures at this point. Russia's tough standpoint regarding the gas problem with Ukraine may show a very serious influence on the political situation in the country on the threshold of parliamentary elections in March 2006.